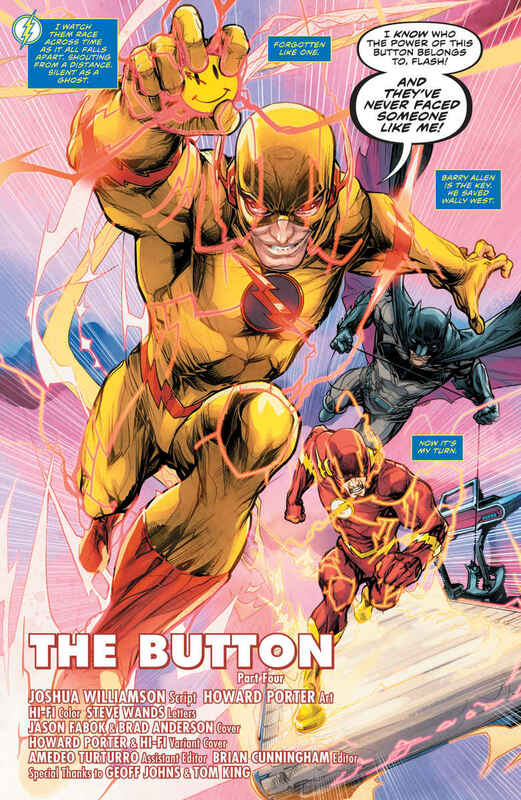 While it's a fun comic book on its own, "The Button" finale unfortunately ends up being little more than an ad for Doomsday Clock. Although “The Button” got off to a bit of a slow start, it certainly picked up in subsequent installments by affording us a team-up we thought we’d never see in the form of two Batmen – Bruce and Thomas Wayne – fighting side by side. 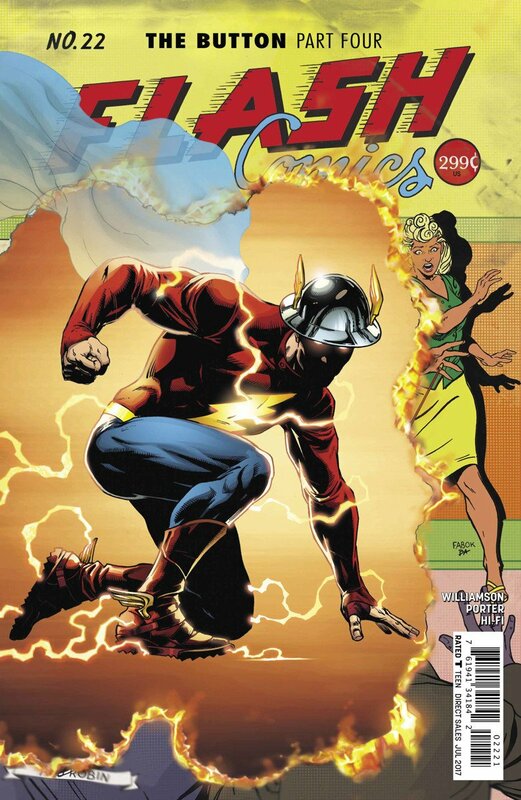 Unfortunately, that may be the only thing this crossover is remembered for as The Flash #22 does a Ric Flair-style face-plant right before the finish line. Now, I don’t want anyone out there to misinterpret what I’m about to say, thinking that I’m frowning upon the efforts put into this arc by writers Joshua Williamson and Tom King. No. I actually thought they did a fine job with what they were allowed, but may have been somewhat handcuffed because they’re basically assisting in what’s Geoff Johns’ story to tell. So, if you wanted the answers that “Superman Reborn” failed to give, you certainly won’t get them here. 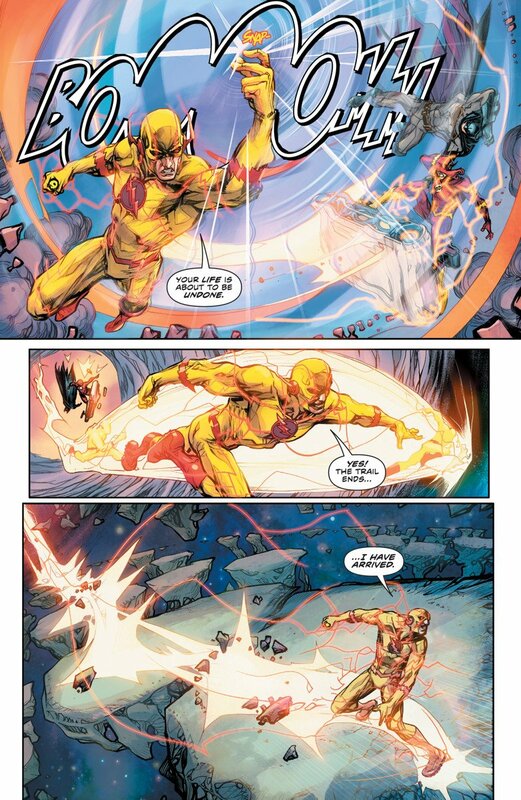 Here’s the gist of it: Batman and the Flash continue pursuing the Reverse-Flash through the timestream before someone sounds the lunk alarm and shatters the Cosmic Treadmill to pieces. 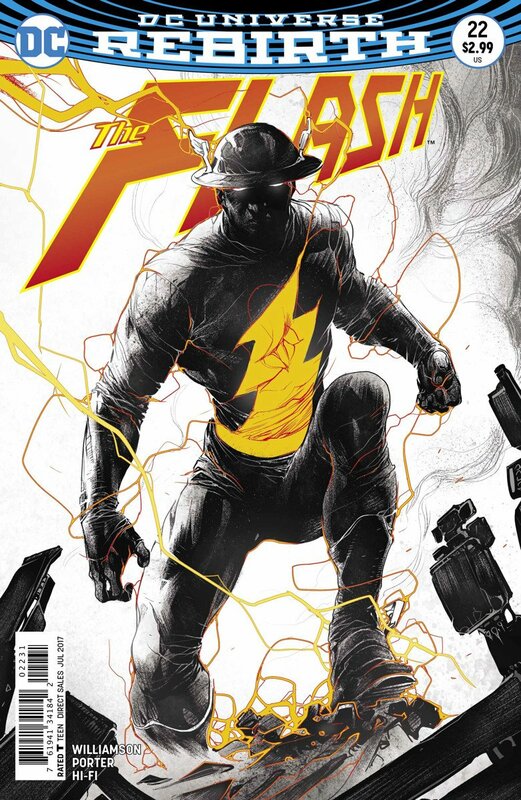 Have no fear, though, because not only do both heroes still boast Bowflex bodies, but the Golden Age Jay Garrick comes to their rescue, effectively delivering on what the cover art promised – for the most part. 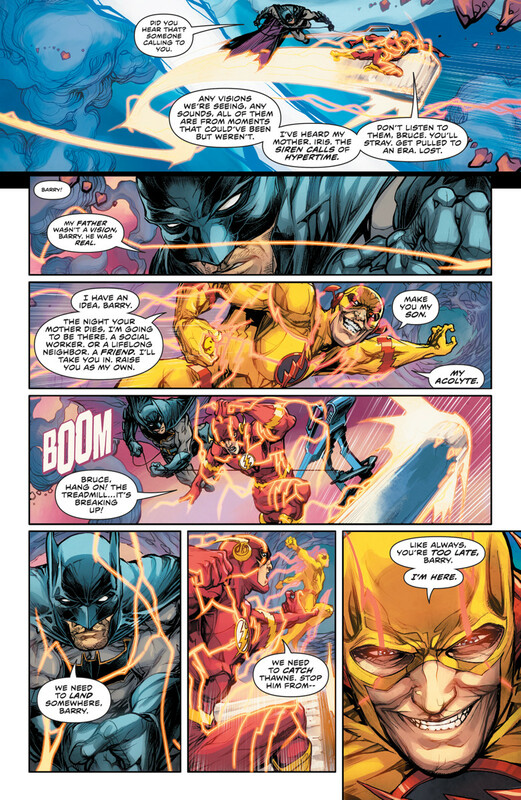 You see, Jay doesn’t stick around for too long because, after exchanging a few words with Barry and Bruce, he’s beamed to parts unknown. Remember the “Treehouse of Horror” episode of The Simpsons in which Groundskeeper Willie would show up to “rescue the lot of you” only to receive an ax in the back in each skit? Well, that’s what this brief cameo made me recall. On the plus side, Howard Porter’s artwork is most assuredly on point, improving on what he had to offer in the previous issue, with a tremendous assist by Hi-Fi’s colors. Believe me, this is the Porter you’ve come to love from recent titles such as Justice League 3001 and Scooby Apocalypse. Yes, it’s a bit of a 180 from what Jason Fabok was doing over in the pages of Batman, but it makes for some truly gorgeous visual storytelling nevertheless. 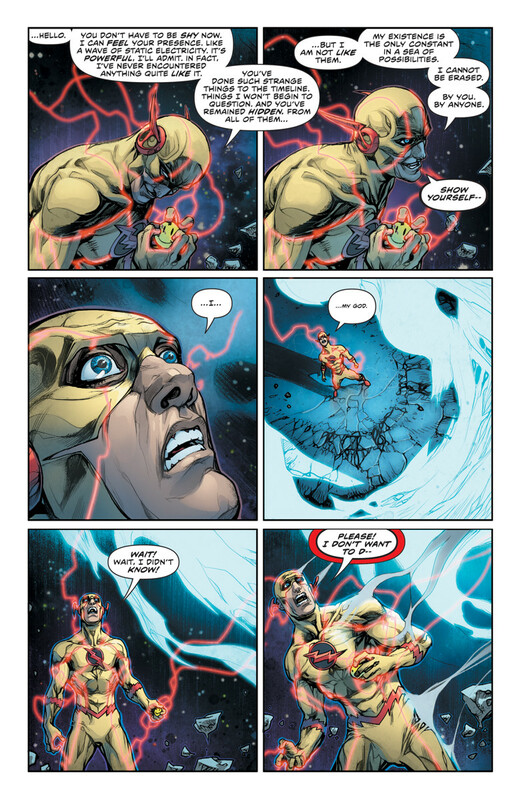 Truth be told, the finale to “The Button” was an alright read, but it ended up being exactly what I feared it’d be: A mere stop on the road to Doomsday Clock, teaching us nothing new aside from confirming the Doctor Manhattan suspicions we’ve all had since first reading the DC Universe: Rebirth one-shot last summer. 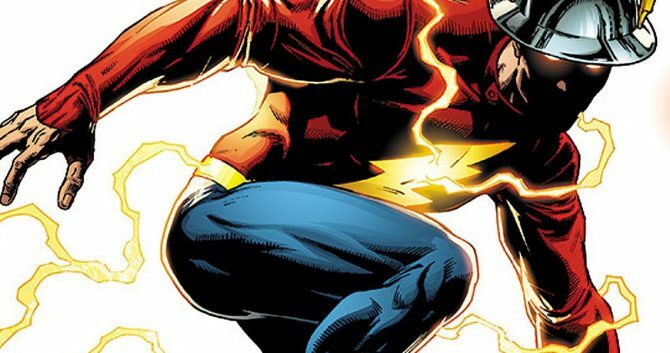 Worse yet, only John Osterman’s hand puts in an appearance and we don’t get any sort of interaction between him and Eobard Thawne. So, if you want to see the big blue nudist have a face to face confrontation with a character from the DCU proper, then you’re going to have to wait until at least November. 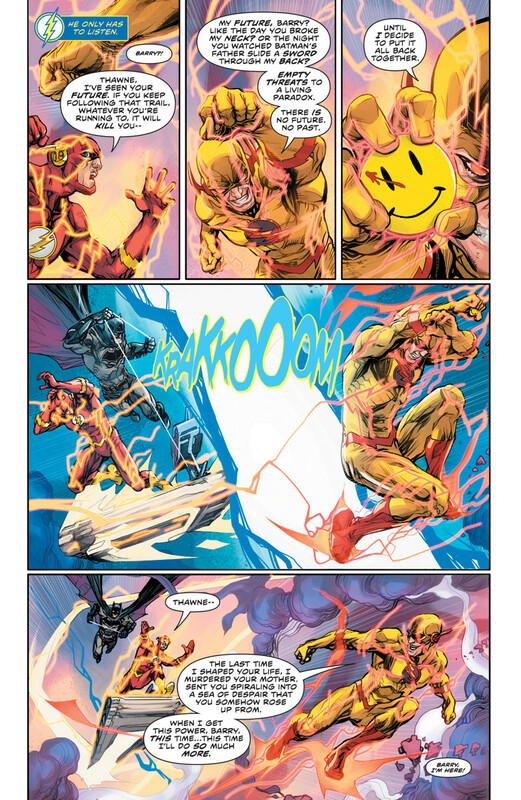 In other words, The Flash #22 is the comic book equivalent of witnessing a double countout in the main event at WrestleMania.